I love LED chasers. A bunch of LEDs neatly turning on and off on a precise timing – lights running one way, then the other way… It’s relaxing, soothing, and hypnotic. There are so many LED chaser/scanner/sequencer circuits out there, some are made with discreet transistors, some based on logic ICs, and more and more others are using microcontrollers. There is one thing in common with all of the LED chaser circuits you find on the net – none of them can operate with just one alkaline battery! Most of us know that LEDs need at least 2.2V or so to light. Blue and white LEDs require even higher, typically 3.2V. So obviously you can’t use just one AA battery to operate an LED chaser. But we all know that there is Joule Thief that boosts voltage high enough to light any LEDs. Why not use that to operate an LED chaser? Wave JT is not only powered by a single AA battery, but it’s feature rich. Here are the highlights of the Wave JT. Uses only one AA battery (or any 1.5V battery you can hook up to). Works well with rechargeables (NiMH or NiCd) too. Eight LEDs, each with its own 256 level brightness control. Energy efficient – works even with a run-down battery, down to 0.6V (0.8V to startup). Versatile PIC microcontroller based LED chaser/scanner/sequencer. Many light animation patterns to choose from. Speed control via multiple taps of a button (double/triple taps to speed up/down). My version is a variation that uses single coil inductor, to make the inductor easily obtainable. I designed the circuit using readily available parts only, to make it an ideal DIY project. There are many options to create 5V from low voltage. First of all, there are many ICs made specifically for this purpose. Those ICs are usually simple to use, and very energy efficient. However they are not cheap – typically a few Dollars a piece. Compare that with a Joule Thief – two transistors, two resistors, a capacitor and an inductor together is still cheaper than just the IC. Plus you know how the circuit works, instead of just taking a black box someone created. I think this is an important point for Makers. As it turned out, a simple Joule Thief circuit that I used here is more than adequate for supplying power for microcontroller project. The fact that microcontroller can actively regulate the Joule Thief’s output voltage (more on this later) to improve overall efficiency makes this simple arrangement attractive. I see a lot of discussion made about conversion efficiency of voltage converter circuit (Joule Thief included). No matter how efficient we make the converter, there will be some energy loss. So why use a voltage booster when you can simply use more batteries? While a simple Joule Thief circuit like the one used with Wave JT does not have very high efficiency in converting voltage, it does allow us to use one battery instead of two or three. The net result is that there will be less batteries consumed because only one battery is used at a time (instead of two or three). The power supply (voltage booster) part of schematic shows somewhat typical Joule Thief circuit, plus a few extra parts. D1 (Schottky diode) and C2 form a rectifier to create DC voltage out of the Joule Thief. Zener diode D2 is added to “clamp” or limit the voltage at 5.1V to prevent damaging the microcontroller (maximum voltage this chip can withstand is 6V). 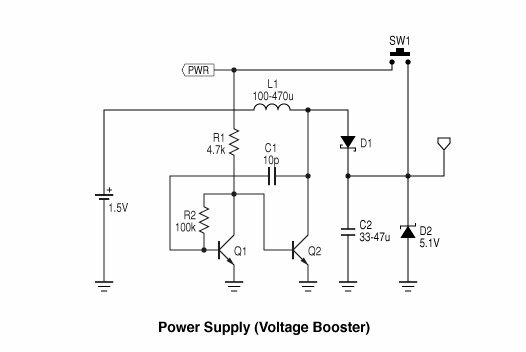 Without the Zener diode there, the output voltage from the boost circuit can go over 6V when no LEDs are lit. Note that after initial power up, microcontroller watches its own supply voltage via A/D converter and adjusts it slightly below the zener voltage, so to not waste precious power from the battery. “PWR” connection to the microprocessor does this by turning on/off bias current to Q2. The button switch SW1 is more than a power switch, it provides pattern change, animation speed change (double tap to increase the speed, triple tap to decrease the speed). Microcontroller reads the button state by periodically turning the “PWR” pin into an input pin. This happens roughly every 8 milliseconds (125 times/second). The reading of the button takes about 2 microseconds each. The booster circuit turns off during this 2 microseconds, but it won’t be felt because capacitor C2 supplies the power during that period. Brightness change is very smooth – using the same PWM technique as my Aurora projects. Unlike other PWM implementations, the curve of brightness change is not linear, but exponent (anti-logarithmic). This is important because our eye’s response to brightness change is more or less logarithmic, therefore LEDs need to change brightness in the opposite fashion. 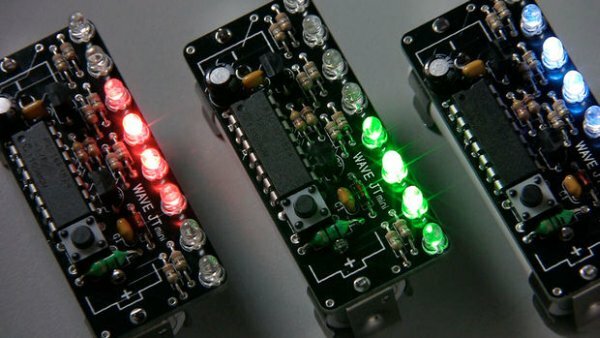 With Wave JT, the hardware PWM output is used as a precision clock to drive the LED bus (common line that connects to all LEDs) and “COLx” pins select which pulse to turn on the LED that’s connected to.